The patterns are both additions and deletions, as emphasized by one of the show’s most recent pieces. In “Palpable Memories II,” a ghostly figure is carved into a D.C. street shot from 2016’s Inauguration Day. Where the single-figure pictures are highlighted by white backdrops, this scene is crowded with people from across the political spectrum. And thus, of course, not-so-hidden tensions. 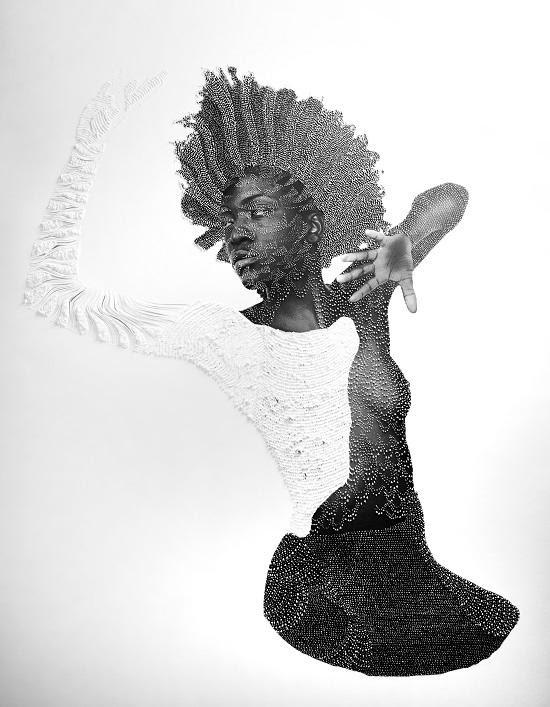 Hidden Tensions: Nate Lewis Through April 11 at Morton Fine Art, 1781 Florida Ave. NW. 202-628-2787. mortonfineart.com. Art League Houston is pleased to host ‘The Homeplace Aesthetic: Finding Black Pasts and Seeking Black Futures in Bottom Land’ a lecture by Dr. Andrea Roberts organized by Nathaniel Donnett in conjunction with the artist’s exhibition ‘In One Form or Another; Verse One’ currently on view at Art League Houston. Within the American landscape, Black vernacular placemaking manifests as spatialized self-determination, intentional design, self-making, and protest. Presently, popular film and TV (i.e., Queen Sugar) express African Americans’ persistent desire to simultaneously return to self-determined, rural settlements while retaining a foothold in urban meccas pregnant with both danger and opportunity. Dr. Andrea Roberts’ research documents and assesses the relevance of rural exodus and return to Black Texas settlements called freedom colonies. Between Juneteenth and the beginning of the Great Depression, Black Texans founded more than 540 freedom colonies. Dr. Roberts partners with grassroots preservationists, descendants of freedom colony founders, who simultaneously call Houston and rural East Texas settlements their homes. Her ethnographic research documents baby boomers’ complex, gendered and raced preservation practices. Of specific concern to Dr. Roberts are descendant communities’ unique approaches to homestead preservation which she calls The Homeplace Aesthetic—the practice of preserving place, reproducing identity, and fostering belonging through commemoration, interior design, and land-based heritage. She concludes the presentation by discussing the implications of the Homeplace Aesthetic for freedom colonies in “bottom land” after Hurricane Harvey. Everyday it’s been the same old mess on my block. Homeless people need a loan just to afford a mattress, to sleep on. On my block they raise ya tax rate up. The medium income wealth of whites -100k up. For Blacks, it’s only 1700- straight up. For Latinos, it’s 2000, nothing I made up. That’s not an anecdote, that’s racial wealth gap data. Gentrifying 5th Ward, ‘cause of low social strata. Jacob Lawrence Great Migration to mass incarcerations. Architecture, Houston, Texas from West Africa. On my block, the police will come test you. 4th Ward Camp Logan, Riots at TSU. 3rd Ward marches on Almeda by design. For higher wages but not treated human. Form became protest then became policies. 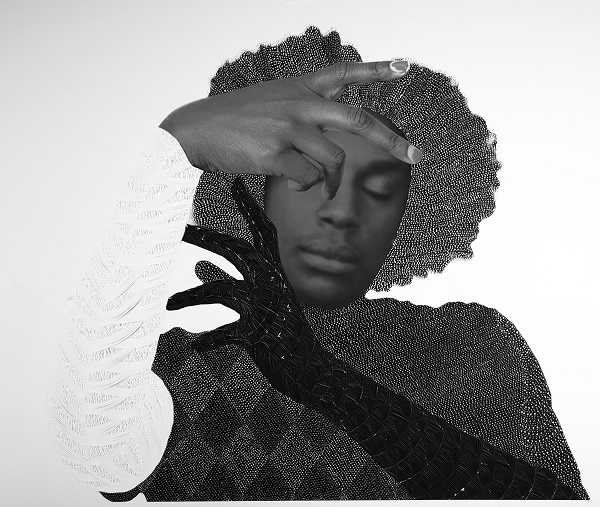 Nathaniel Donnett lives and works in Houston, Texas and studied at Texas Southern University. Donnett is the founder of the website blog “Not That But This”. which was funded by a 2015 Idea Fund /Andy Warhol Foundation Grant, 2017 Houston Arts Alliance Individual Artist Grant, 2015 Houston Downtown Vehicular Wayfinding Signs Project public art commission. Donnett has also received the 2014 Harpo Foundation Grant, 2011 Houston Arts Alliance Individual Artist Grant, 2011 Idea Fund/Andy Warhol Foundation Grant, 2010 Artadia Award. He’s exhibited at The American Museum, Washington, DC, The Kemper Contemporary Arts Museum, Kansas City, MO, The Theresa Hotel, Harlem, NY, Harvey B Gantt Art Center for African American Arts and Culture, Charlotte, NC, The Mattatuck Museum, Waterbury CT, The Contemporary Arts Museum Houston, Houston, TX, Project Row Houses, Houston, TX, Texas Southern University Museum, Houston, TX, The New Museum, NY, NY, The National Museum in Lima, Peru and The Modern Museum of Peru. Nathaniel Donnett is a recipient of an Individual Artist Grant Award. This grant is funded by the City of Houston through Houston Arts Alliance. This exhibition is generously sponsored in part by Linda Darke and Greg Shannon. More about this exhibition at Art League Houston. Click HERE to view available artwork by NATHANIEL DONNETT. Contact Morton Fine Art for acquisition. 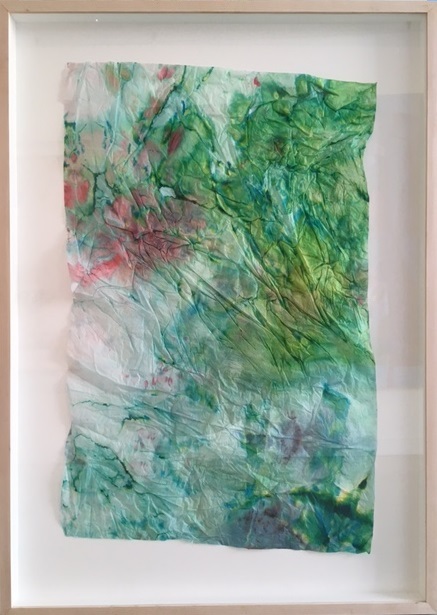 Morton Fine Art is happy to announce the recent arrival of new tissue paper and ink and tissue ink monoprint artworks by MAYA FREELON ASANTE. Maya Freelon Asante is an award-winning artist whose artwork was described by poet Maya Angelou as “visualizing the truth about the vulnerability and power of the human being,” and her unique tissue paper work was also praised by the International Review of African American Art as a “vibrant, beating assemblage of color.” She was selected by Modern Luxury Magazine as Best of the City 2013, by the Huffington Post’s “Black Artists: 30 Contemporary Art Makers Under 40 You Should Know”, and Cosmopolitan Magazine’s “Art Stars” as “the most badass female artists in the biz.” Maya has exhibited her work nationally and internationally including Paris, Ghana, and US Embassies in Madagascar, Italy, Jamaica and Swaziland. She has been a professor of art at Towson University and Morgan State University. Maya has attended numerous residencies including Skowhegan School of Painting and Sculpture, the Korobitey Institute and Brandywine Workshop. She earned a BA from Lafayette College and an MFA from the Museum School in Boston. 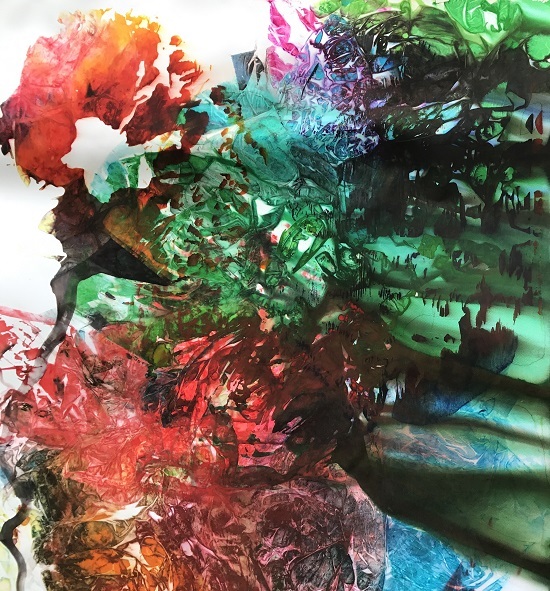 Click HERE to view available artwork by MAYA FREELON ASANTE. Natalie Cheung: Increments in Time and Nate Lewis: Tensions in Tapestries On view through April 26 at Morton Fine Art, 1781 Florida Ave. NW. 202-628-2787. mortonfineart.com. 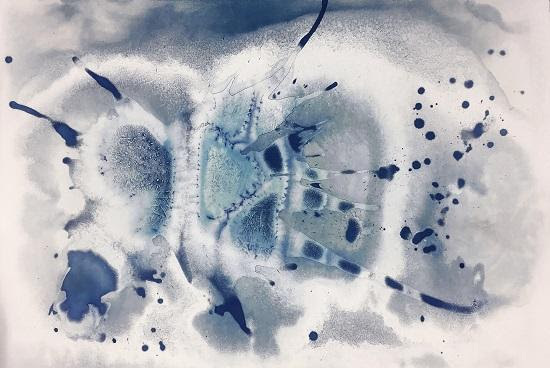 To judge by their titles, change must be the subject of Natalie Cheung’s cyanotypes. Each picture in her Morton Fine Art show, “Increments in Time,” is named after a period of as little as one and as many as 76 hours. This is how long it took water to evaporate from the photographic paper, yielding studies in blue, black and white. The D.C. artist has turned the process, once used for architectural blueprints, into something abstract and unpredictable. Her pictures may resemble Rorschach tests and microscopic views, but all they truly illustrate is the process by which they were made. Their poetry is an accident of chemicals and duration. To Nate Lewis, whose “Tensions in Tapestries” also is at Morton, the African American body is a landscape to be transformed. 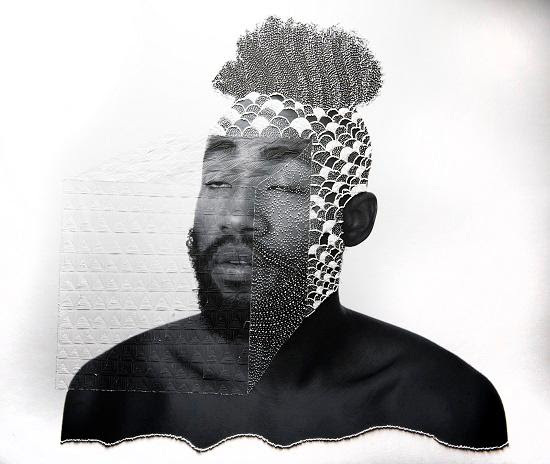 He cuts and scrapes black-and-white photographic portraits, removing pigment while adding patterns and flocked textures. The effect recalls African weaving and skin embellishment, but also reflects the influence of the D.C. artist’s job as an intensive-care nurse, seeking to heal the most damaged. In pieces such as “Funk and Spine,” the surface of a woman’s body is almost entirely remade, yet sinew, bone and essence endure. 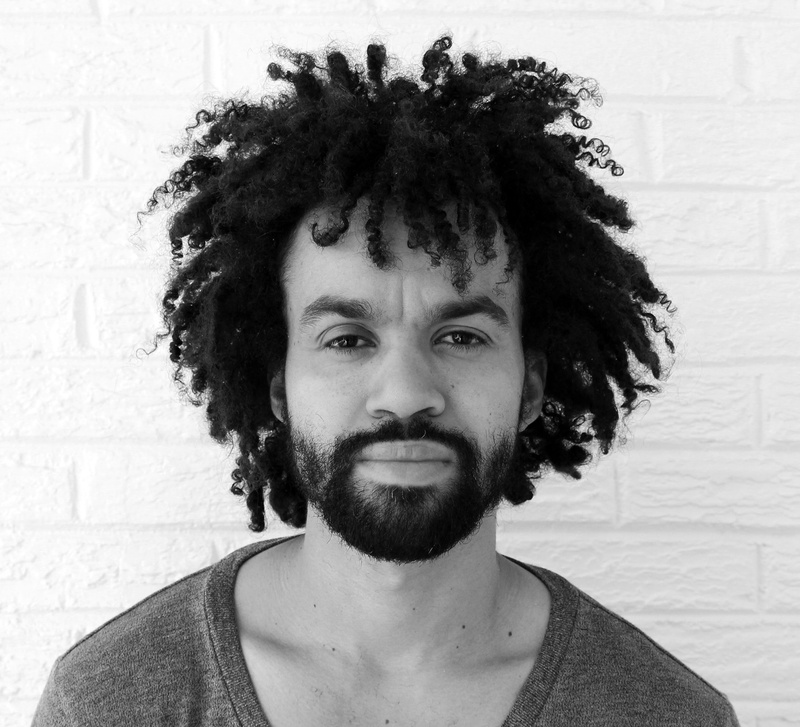 We are excited to announce new works by Washington, DC based artist NATE LEWIS. They are from his latest series Tensions in Tapestries. We all have a lens through which we see. Our lens is distilled by our patterns of seeing and thinking which continually refines our lens. The lens we come to form becomes our filter. Using figurative and portrait style images I hand-sculpt patterns and textures on to single sheets of paper that reveal unseen tensions on and within bodies representative of the past, present, and future – the physical and the spiritual, the tangible and intangible. Internal, as well as external influences come to refine our patterns of thinking, seeing, interacting and loving. Through the use of presence and absence, textures and distortion, I aim to challenge the filters we hold that dictate our views and our actions. Through an attentive, intentional process of sculpting patterns and terrains of texture on bodies, I seek for this work to mirror the intentionality and consistency it can take in ones patterns of thinking and seeing to hold an empathetic lens. Nathaniel Lewis grew up in Beaver Falls, near Pittsburgh, Pa. Born 1985, Nate benefited from the cultural mix of his Trinidad-born father who was raised in Brooklyn and his white American-born mother, raised in Philadelphia. He graduated from VCU with his BSN and has been a practicing critical care nurse for the past five years as well as professional fine artist. Tensions in Tapestries is Nate’s second solo exhibition at Morton Fine Art. Please find images of the new works below. You can see more of Nate’s available works HERE. Both artists will be in attendance. light, paper, chemical reaction and chance which hearken back to the scientific roots of the medium. The prints record the transition from liquid to blueprint. The title of each work indicates the hours in which it took water to evaporate completely from the paper. What remains is the aftermath of an event, a map. This work examines the way in which nature perpetually creates patterns, seemingly random and chaotic yet with regularity and repetition. Natalie was born in Falls Church, Virginia. 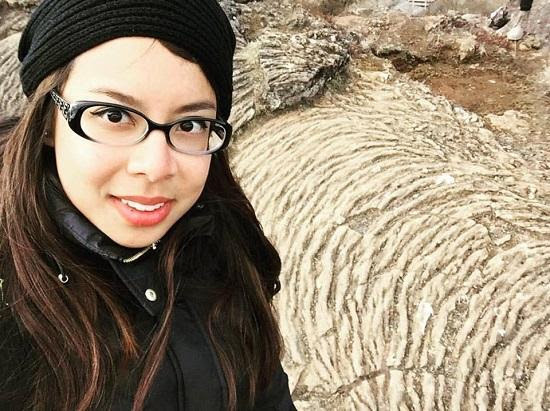 She received her MFA in Photography from Tyler School of Art in Philadelphia and her BFA in Photography from the Corcoran College of Art + Design in Washington, DC. 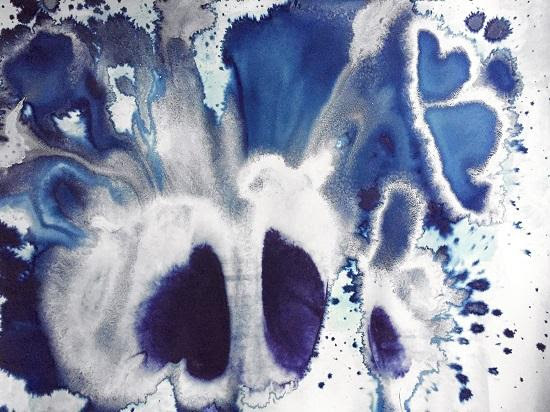 Her work has been exhibited nationally and internationally; she has been profiled in Washington Spaces Magazine and has her work is represented in numerous collections including the Museum of Fine Art Houston and the DC Commission on the Arts and Humanities. Cheung has taught at the George Washington University as well as the Corcoran College of Art + Design and Temple University, Tyler School of Art. This marks her second solo exhibition at Morton Fine Art. Founded in 2010 in Washington, DC, Morton Fine Art (MFA) is a fine art gallery and curatorial group that collaborates with art collectors and visual artists to inspire fresh ways of acquiring contemporary art. Firmly committed to the belief that anyone can become an art collector or enthusiast, MFA’s mission is to provide accessibility to museum-quality contemporary art through a combination of substantive exhibitions and a welcoming platform for dialogue and exchange of original voice. 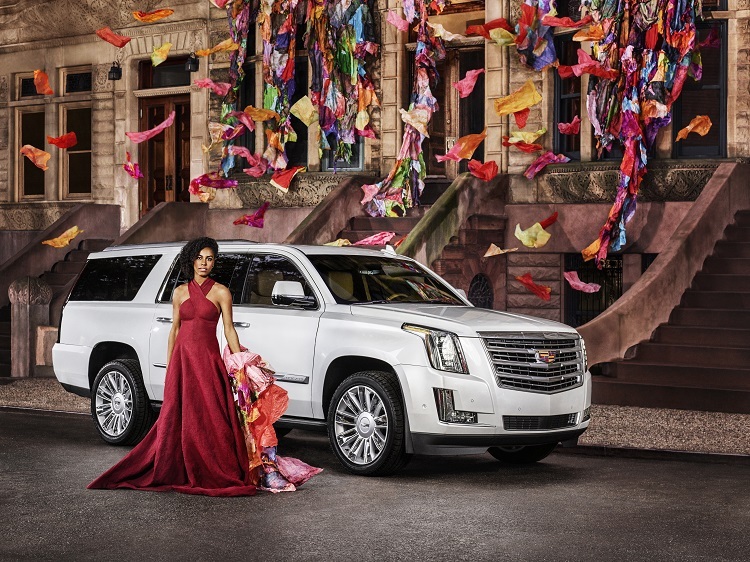 We are very excited to announce that artist MAYA FREELON ASANTE and her brilliant tissue paper and ink artwork has been featured in Cadillac’s new ad campaign “The Art of Daring”! For Maya’s available works, please visit her page on our website or contact the gallery.